Cookies for breakfast? Yes, please! These Applesauce Oats and Dried Cherry Breakfast Cookies are the perfect cookie for mornings when you don’t have time to make a full breakfast and need something quick and easy to grab as you head out the door. It’s that time again — time for #LeftoversClub! I am so proud of myself for actually getting my recipe made and shipped out BEFORE August even hit! Usually I’m scrambling at the last minute, but I planned ahead this time and totally rocked it. Until I realized I also accidentally double-booked my calendar and had two recipes to post today. Oops. Looks like you’re getting Blackberry Ginger Mojitos AND Applesauce Oats and Dried Cherry Breakfast Cookies. Too bad these two things don’t really go together. Like, at all. Another oops. 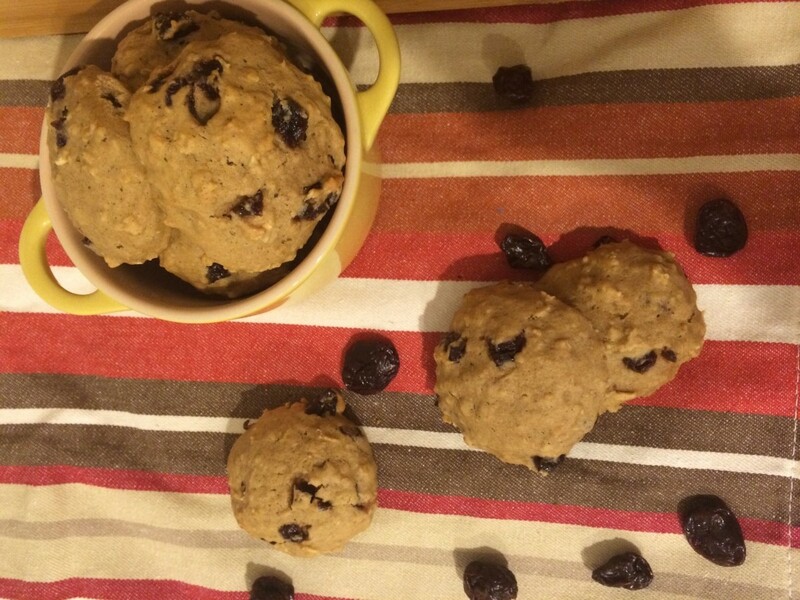 Easy, on-the-go recipes like these Applesauce Oats and Dried Cherry Breakfast Cookies sometimes make the best snacks. They are easy to throw in your bag when you’re running out the door in the morning and need a quick breakfast and even better when you’re out and about all day and need an afternoon pick-me-up to keep your energy going. The cinnamon and nutmeg are what really give these cookies a distinct taste and smell. I love the chewiness of the dried cherries and their cake-like texture. For a breakfast cookie, this works for me. Normally, I like my cookies underdone and super soft, but for a breakfast cookie I’ll take it. 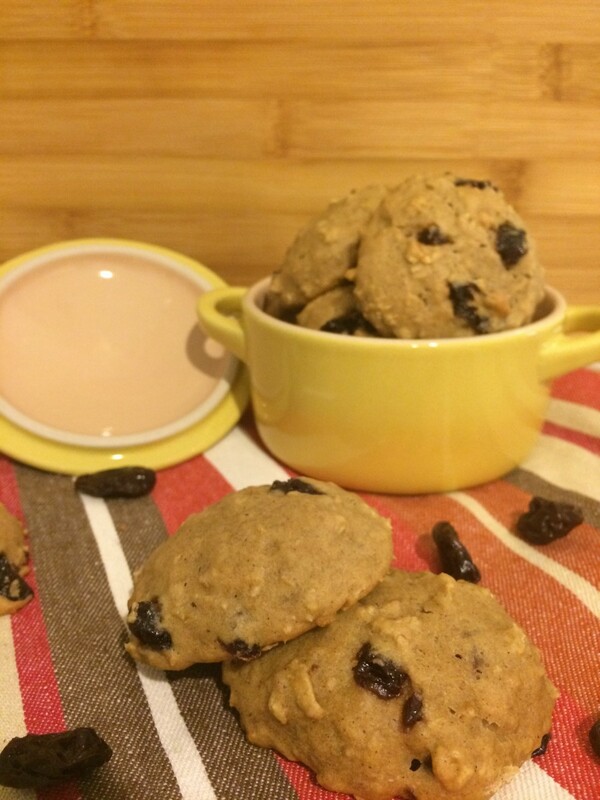 These Applesauce Oats and Dried Cherry Breakfast Cookies are just the thing that my #LeftoversClub partner, Jaren from Diary of a Recipe Collector, needs. She has THREE kids, so I have a feeling she’s always on the go! Jaren is new to #LeftoversClub so I’m super excited to get to be her first swap. Her blog is full of yummy treats like these Mango Cream Popsicles and delicious entrees like these Cajun Boiled Shrimp Stuffed Potatoes. YUM! I hope Jaren and her family enjoy my Applesauce Oats and Dried Cherry Breakfast Cookies! Cookies for breakfast? Yes, please! These Applesauce Oats and Dried Cherry Breakfast Cookies are the perfect cookie for mornings when you don't have time to make a full breakfast and need something quick and easy to grab as you head out the door. Add applesauce, brown sugar, butter and egg to the bowl of a stand mixer and beat on medium. Add flour, oats and baking powder and mix until just combined. Fold in the chopped cherries. Chill dough for 30 minutes. Line (2) baking sheets with parchment paper or silicone baking mats and set aside. Preheat the oven to 375 degrees. Use a medium cookie scoop to portion out cookies onto prepared baking sheets. Bake for 15 minutes. Want to join us next month for #LeftoversClub? Check out the Leftovers Club for details and to sign up! « Blackberry Ginger Mojitos and Celebrating a 30th Birthday! I would eat these for breakfast, lunch, and dessert!! Shaina, these were so yummy and truly perfect for breakfast! I couldn’t wait for you to post the recipe! They are perfect for the upcoming fall too!!! Pinned! I’m so glad you liked them, Jaren!! 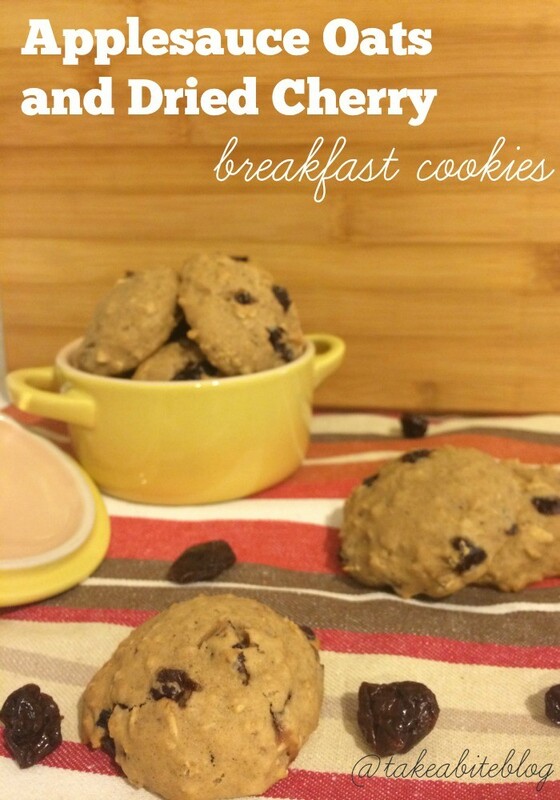 I have always wanted to make breakfast cookies (seriously, who doesn’t want to eat cookies for breakfast??) and I am LOVING this combination! Can’t believe you sent these out before the month was over! I still can’t pull that off yet. These cookies look like the perfect grab and go breakfast! Haha, Lisa, I couldn’t believe it either! yum i love using applesauce in cookies… makes them so moist! they look delicious! Agreed, Thalia! Applesauce is a great way to lighten up a recipe too. Shaina, these sound like a delicious breakfast cookie. I love grab-and-go kind of recipes. I bet your partner loved these! I just love your Breakfast Cookies, a great combination! Thanks so much for sharing with Full Plate Thursday and have a great weekend! Thanks, Miz Helen, glad you stopped by! 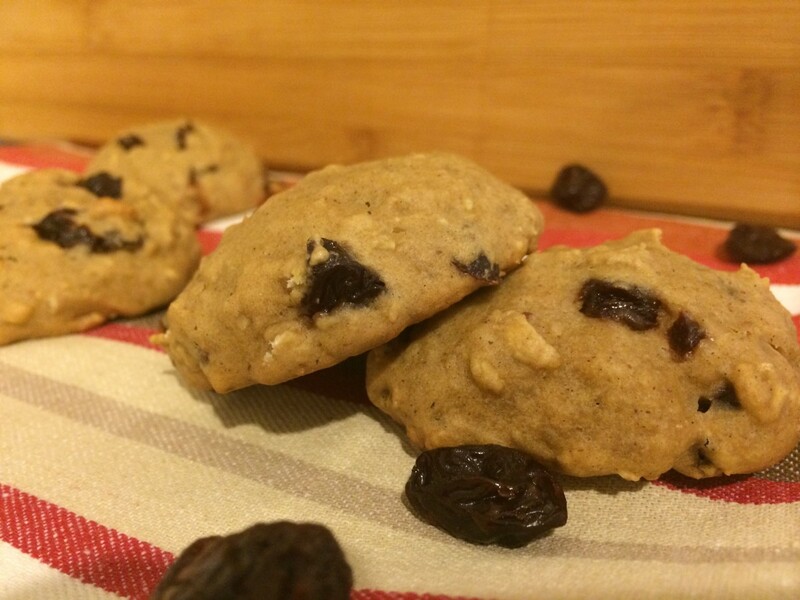 I like every word in that title, Applesauce Oats and Dried Cherry Breakfast Cookies! Grab and Go breakfast is a great idea on busy mornings. Thanks for sharing with us at The Yuck Stops Here. Please come again.